"The Savage Queen 野性的女王 (yě xìng dè nǚ wáng)"
The only female in the entire Romance of Three Kingdoms story to ever take part in battle, Zhu Rong is one fearsome woman. Not only was she brave, she was also capable in combat and intelligent. Wife of the Barbarian King, Meng Huo 孟获, she led an army to invade Shu Han 蜀汉 after her husband was cowed by Zhuge Liang 诸葛亮's advancing troops. She did so well in battle, in fact, that she captured 2 of Shu Han's generals; Zhang Yi 张嶷 and Ma Zhong 马忠. Her next opponents were the highly decorated generals Zhao Yun 赵云, and Wei Yan 魏延. Both these generals fled without much of a fight, but Zhu Rong smelled a rat and did not give chase. She was no fool as Shu Han had a trap set for her indeed. Yet when Wei Yan turned back to hurl insults at her, her emotions got the better of her and she gave chase. She fell into Shu Han's trap and was captured. By then, she had already left a deep impression as a woman not to be messed with. BARBARIANS南蛮入侵 have no effect on you. When any BARBARIANS 南蛮入侵 used by other players is placed into the discard pile after all damage has been resolved, you acquire it. Character ability 2: "Fearsome Blade 烈刃 (liè rèn)"
Every instance after you inflict damage to your target by using ATTACK杀, you can conduct a Points Duel with that target player. If you win, you acquire a card from that player. She cannot activate “Fearsome Blade” if she inflicts damage to a player that is not her target. That means she cannot points duel with a player that receives damage by shackling effect, for example. Contrary to what the game makers want you to conclude, Zhu Rong did not ride on a "Giant Elephant". That privilege was reserved for King Mu Lu 木鹿大王, an ally of the Southern Barbarians. Zhu Rong is good at taming elephants and use them in war, as well as calling them back after war. "Fearsome Blade" referred to Zhu Rong's incredible knife throwing skills. It is said that she never misses at her throwing. 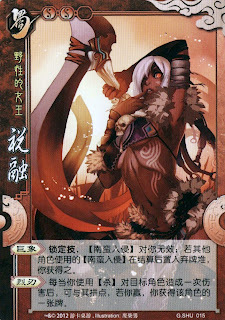 In the story, Zhu Rong either outmatched her opponent by her lance or a trap, then she would use her throwing knives. If she threw it successfully (wins the points duel), she could catch her opponent as prisoners (taking a card from the victim). Does she need to reveal if barbarians are played or can she take the hit and remain hidden? More generally speaking, do characters need to reveal if they have an enforced ability or can they choose not to activate and remain hidden?